Oh my goodness, I’m pretty sure these two are the most stylish couple we’ve ever met! 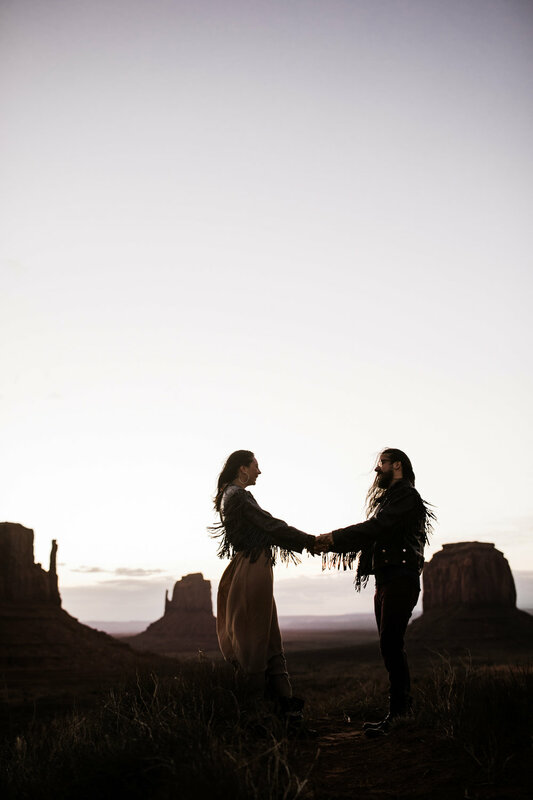 I’ve been wanting to do an engagement session in Monument Valley every since our very first trip there a few years ago (wow throwback), so when Rachel reached out about it, I knew they were the perfect people!! 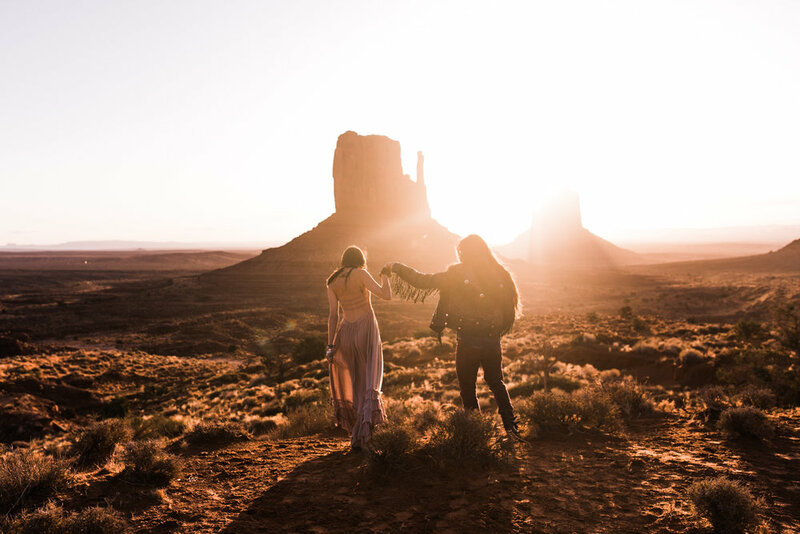 Rachel is a vintage clothing shop owner, so their style looks like it was made for the classic, western vibe of Monument Valley. On top of that, they were some of the kindest people - we had so much fun getting to know them. I was really psyched they were willing to meet up for sunrise, and despite the lighting storms all night the morning gave us a stunning sunrise with a nice little cloud layer for some cool blue light (those photos with the moon are some of my favorites!) followed by the most gorgeous golden light flying up the while valley. We were pretty much immediately greeted by a sweet little black res dog, and eventually let all the dogs (our Charlie, their Nia + Ruby) out to play as we explored into the valley a little bit and marveled at the epic monuments! We had so much fun trying to round up their two pups for a family photo (I’m honestly psyched I got one with all four of them in the frame!!) and dancing around in the gorgeous sunlight before the morning crowds began to fill the valley. 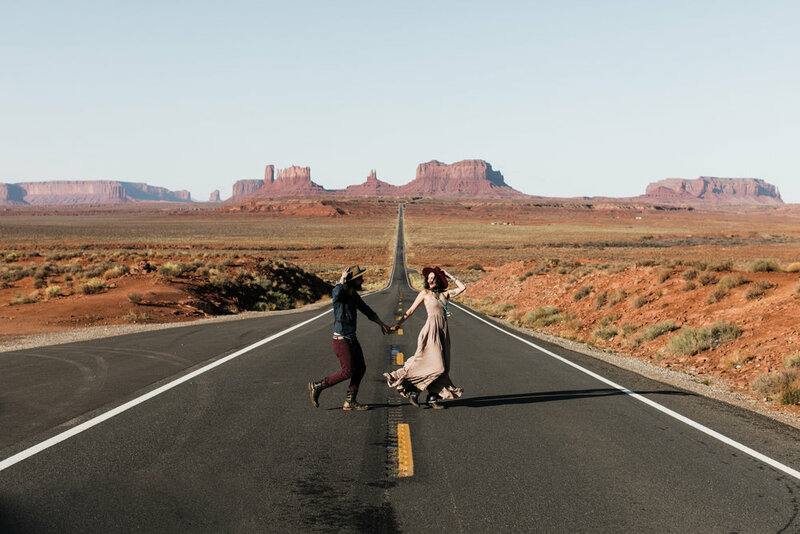 We ended their session out on the classic long western road and got super lucky with some long gaps between cars for plenty of photos that scream southwest road trip adventure. Rachel even pulled out her camera for a few photos of Callen and I!! We all had so much fun together that we decided to let the good convos continue over breakfast at the cutest little hotel cafe on the river in Mexican Hat, Utah. It was a great day that we truly never wanted to end, and we hugged goodbye with the promise we’d come hang out with them in their stylish new home in Tucson (seriously, check out Rachel’s instagram for some major boho interior inspiration), and that they’d make a trip up to Moab for some desert camping. 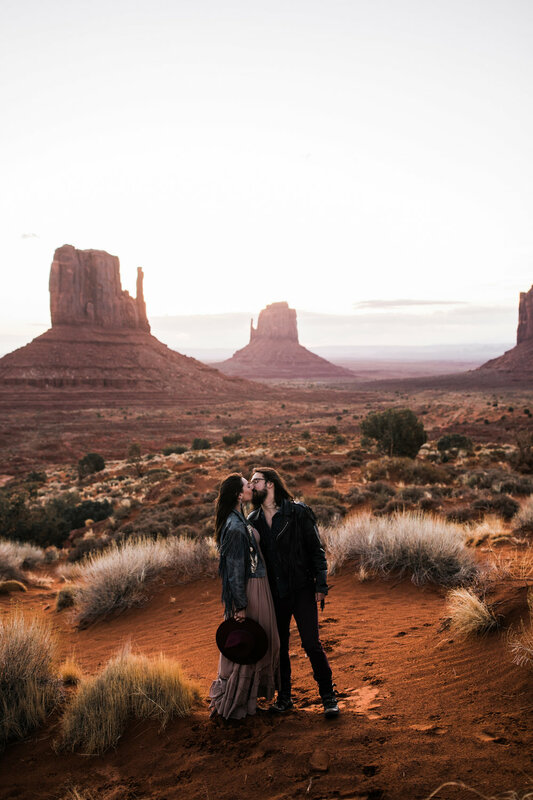 These photos will probably go down as some of my favorites — I seriously can’t get over how well their look matched the rad landscape! 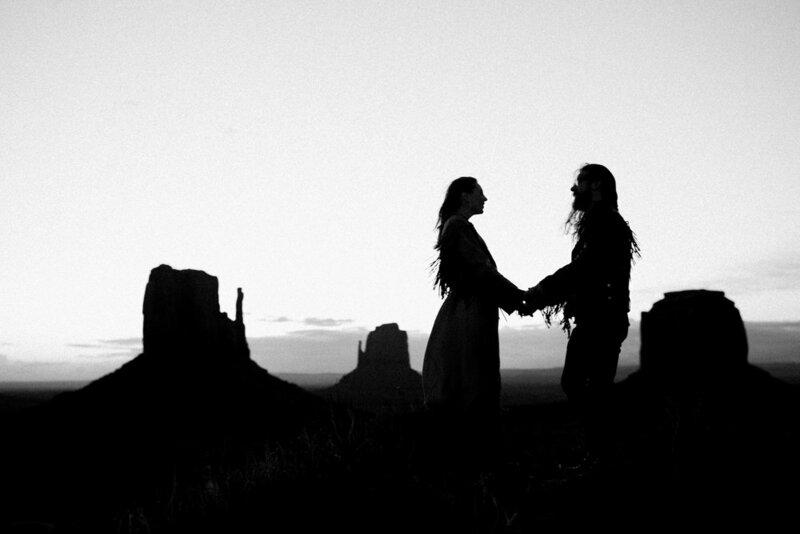 We absolutely love Monument Valley and honestly don't know why more people don't decide to do photos out there! 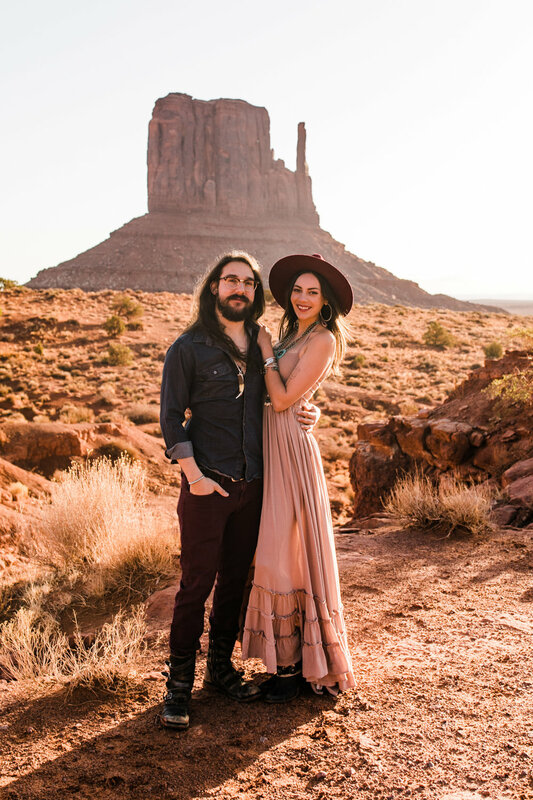 If you're considering eloping some were gorgeous and want the iconic southwestern look, this is definitely the place to go!